UPG needs your help so another 25,000 people in Haiti can feed themselves! Hurricane Matthew wiped out crops in SW Haiti. Famine is imminent. Our first batch was delivered in April: Seeds for about 26,000! Now we need YOU to help us keep going. 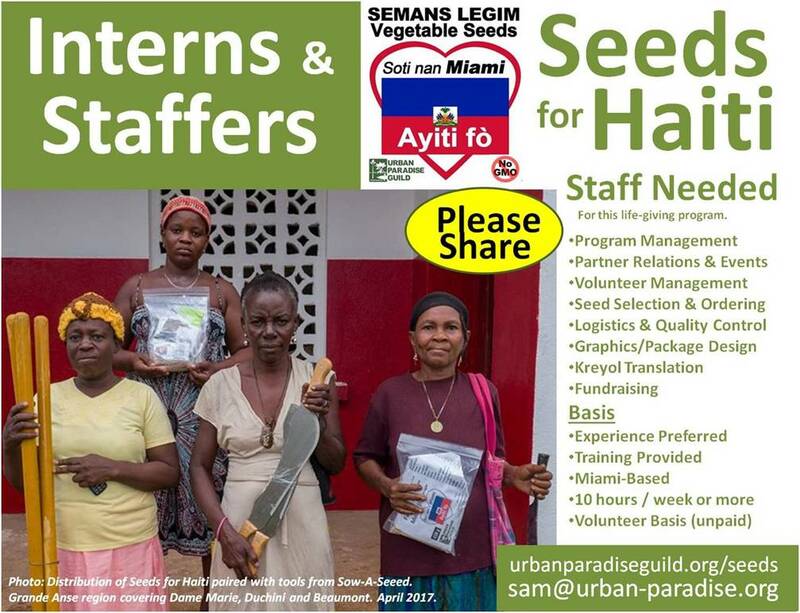 Seeds for Haiti: Click Here for Info! 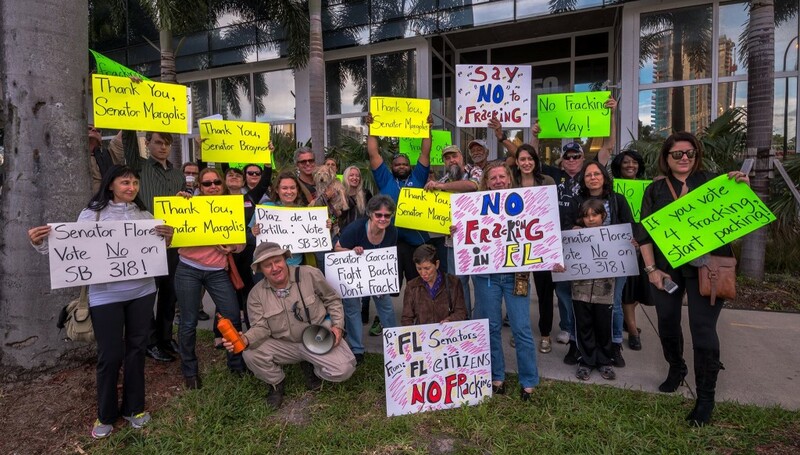 Thank you Miami for standing up for clean energy and voting NO on Amendment 1! Short & sweet way to get started as a Volunteer & get our Newsletter! Click Here. We want to live in URBAN PARADISE. There’s been a lot of damage done, so it will take work and creativity. Click on the activity you like for more info, and then make your Reservation! You will change the world. Read what’s happening in Urban Paradise! To Subscribe & get it delivered fresh, click NEWSLETTER! You can provide us with input on what you care most about too. Our mission is to re-create native habitats in the Urban areas of Miami-Dade County, and to promote sustainable models for healthy living that safeguard, enhance and integrate the human and natural worlds for the benefit of both. Urban gardening and fruit trees are examples of the plant habitats that sustain humans. We do this too, because how can a place be Urban Paradise without great fruits & vegetables? UPG now has many project Locations to serve YOU! Project depend on season and Location needs, but they include Urban Gardening, Forestry, Nursery… you might plant Native Habitats, Butterfly Habitats, or a Food Forest! When you invest just 3 hours per month at one of these Locations, you become part of the solution. UPG also needs Interns, Team Leaders, Managers and Specialists! Go to the Calendar, select a Volunteer Opportunity, and get started THIS WEEKEND! Families are welcome at most UPG Locations. See the Volunteering menu above. the Urban areas we live in can become Paradise again. She will repay us with a bounty of human health, and in recreational and economic opportunity. The habitat we create is an investment in the places we where we live – and much more. It also addresses global problems such as Sea-Level Rise, Fisheries Collapse, and Global Warming at the same time. The benefits of Urban-grown food go far beyond taste and nutrition for the consumer. It fights Climate Change directly in two critical ways: Minimal Transportation, and most importantly (when grown organically), it stops the pollution caused by chemical farming. South Florida is more at risk to the combined effects of Hurricanes and Sea-Level Rise than any metropolitan area on the Earth. Failure is not an option for Miami-Dade. Let’s invite an environment like the Keys and the Bahamas back into our Bay, and butterflies into our yards and balconies at work and at home. It isn’t all work – we play a lot too. There are a thousand ways to enjoy the environments of South Florida – and a thousand reasons to take care of it. They’re good for Mother Nature and all her children. Come out, get a workout, and help the environment too. Our work maintains our personal health while it and heals environmental damage. Activities include planting of mangroves, upland trees and butterfly gardens, nursery work, education, stewardship, and especially recreation.